This ticket allows adult (18+) access to the Wychwood Festival 2019 from Friday, 31st May - Sunday, 2nd June 2019. It includes camping. This ticket allows adult (18+) access to the Wychwood Festival 2019 from Friday, 31st May - Sunday, 2nd June 2019. It does NOT include camping. This ticket allows adult (18+) access to the Wychwood Festival 2019 for Friday only. Day camping ticket can be purchased separately from the Camping Ticket section. This ticket allows adult (18+) access to the Wychwood Festival 2019 for Saturday only. Day camping ticket can be purchased separately from the Camping Ticket section. This ticket allows adult (18+) access to the Wychwood Festival 2019 for Sunday only. 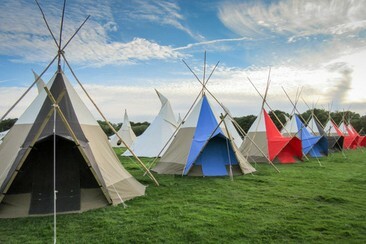 Day camping ticket can be purchased separately from the Camping Ticket section. This ticket allows students, young people (aged 16-17) and ES40 or disabilities to access to the Wychwood Festival 2019 from Friday, 31st May - Sunday, 2nd June 2019. It includes camping. This ticket allows students, young people (aged 16-17) and ES40 or disabilities to access to the Wychwood Festival 2019 from Friday, 31st May - Sunday, 2nd June 2019. It does NOT include camping. This ticket allows students, young people (aged 16-17) and ES40 or disabilities access to the Wychwood Festival 2019 for Friday only. Day camping ticket can be purchased separately from the Camping Ticket section. This ticket allows students, young people (aged 16-17) and ES40 or disabilities access to the Wychwood Festival 2019 for Saturday only. Day camping ticket can be purchased separately from the Camping Ticket section. This ticket allows students, young people (aged 16-17) and ES40 or disabilities access to the Wychwood Festival 2019 for Sunday only. Day camping ticket can be purchased separately from the Camping Ticket section. This ticket allows young people (aged 10-15) to access to the Wychwood Festival 2019 from Friday, 31st May - Sunday, 2nd June 2019. It includes camping. This ticket allows young people (aged 10-15) to access to the Wychwood Festival 2019 from Friday, 31st May - Sunday, 2nd June 2019. It does not include camping. This ticket allows young people (aged 10-15) access to the Wychwood Festival 2019 for Friday only. Day camping ticket can be purchased separately from the Camping Ticket section. This ticket allows young people (aged 10-15) access to the Wychwood Festival 2019 for Saturday only. Day camping ticket can be purchased separately from the Camping Ticket section. This ticket allows young people (aged 10-15) access to the Wychwood Festival 2019 for Sunday only. Day camping ticket can be purchased separately from the Camping Ticket section. This ticket allows children (aged 5-9) to access to the Wychwood Festival 2019 from Friday, 31st May - Sunday, 2nd June 2019. It includes camping. This ticket allows children (aged 5-9) to access to the Wychwood Festival 2019 from Friday, 31st May - Sunday, 2nd June 2019. It does not include camping. This ticket allows young people (aged 5-9) access to the Wychwood Festival 2019 for Friday only. Day camping ticket can be purchased separately from the Camping Ticket section. This ticket allows young people (aged 5-9) access to the Wychwood Festival 2019 for Saturday only. Day camping ticket can be purchased separately from the Camping Ticket section. This ticket allows young people (aged 5-9) access to the Wychwood Festival 2019 for Sunday only. Day camping ticket can be purchased separately from the Camping Ticket section. This free ticket allows children (aged 0-4) to access to the Wychwood Festival 2019 from Friday, 31st May - Sunday, 2nd June 2019. It includes camping. This ticket allows children (aged 0-4) to access to the Wychwood Festival 2019 from Friday, 31st May - Sunday, 2nd June 2019. It does not include camping. This ticket allows young people (aged 0-4) access to the Wychwood Festival 2019 for Friday only. Day camping ticket can be purchased separately from the Camping Ticket section. This ticket allows young people (aged 0-4) access to the Wychwood Festival 2019 for Saturday only. Day camping ticket can be purchased separately from the Camping Ticket section. This ticket allows young people (aged 0-4) access to the Wychwood Festival 2019 for Sunday only. Day camping ticket can be purchased separately from the Camping Ticket section. This ticket allows adult (18+) access to camp at Wychwood Festival 2019. Please note you need a festival ticket as well as a camping ticket to camp. This ticket allows young people (under 16) access to camp at Wychwood Festival 2019. Please note you need a festival ticket as well as a camping ticket to camp. This ticket allows allows students, young people (aged 16-17) and ES40 or disabilities access to camp at Wychwood Festival 2019. 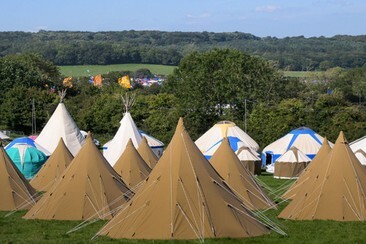 Please note you need a festival ticket as well as a camping ticket to camp. Hearthworks Yurts & Tipis provide beautiful yurts and tipis that are comfortable, spacious, and come in a range of sizes to suit couples, families, or large groups of friends. 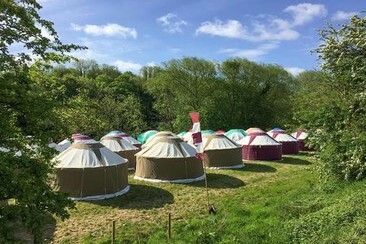 Located in the Wychwood Camping Area, which includes its own exclusive facilities such as showers and toilets, Hearthworks yurts and tipis are pre-erected and ready for your arrival. 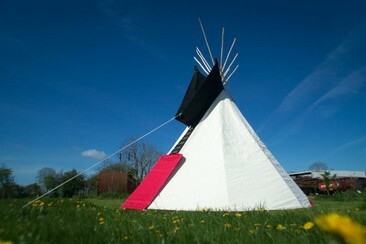 The Reception Tipi staff will welcome you, and ensure your stay goes smoothly. An information service, phone charging facilities, plus an expert maintenance crew are only some of the perks provided with Hearthworks Yurts & Tipis. 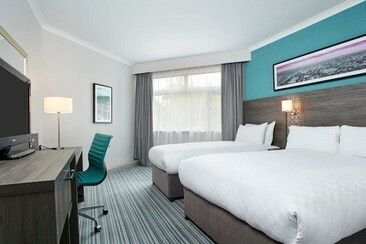 Jurys Inn Cheltenham is located just off Gloucester Road on the edge of the town. 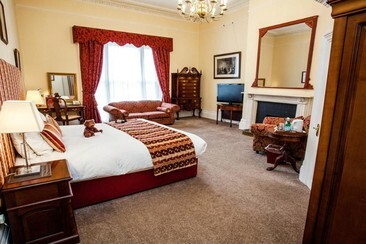 The hotel is a five minute car ride from Cheltenham Spa train station and not far from the town's top sights and attractions. The hotel offers 122 stylish bedrooms and, on site, is the Burford Room Restaurant with a very popular food and wine menu. It also features a full-equipped gym along with tennis courts, a heated swimming pool and sauna rooms. Breakfast is included. 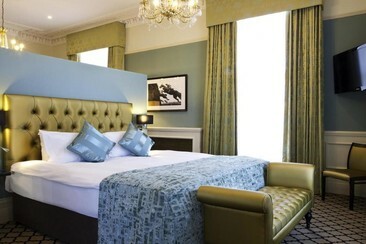 The Queens Hotel Cheltenham - MGallery by Sofitel is a grand and imposing Regency property sitting right in the heart of the picturesque spa town of Cheltenham, overlooking the beautiful Imperial Gardens and Promenade, close to shops, restaurants and overlooking Imperial Gardens. Cheltenham Racecourse is less than 3.2 km away. Airy rooms offer a classic style with neutral tones and vibrant accents. They come with en suite bathrooms, Internet access and cable TV, facilities for making tea and coffee. Quietly situated on one of Cheltenham’s premier Regency squares, Clarence Square is a leafy, quiet, sanctuary perfectly placed to explore all that Cheltenham has to offer. Take advantage of the hotels enviable location and leave the car behind as we are just a few minutes walk from the centre of Cheltenham with its fine selection of shops, restaurants and places of interest. Pittville Park, the Pump Rooms, the Racecourse and the Ladies College are all within easy walking distance. The warmly decorated rooms feature ensuite bathrooms, plus free WiFi, flat-screen TVs, DVD players, and tea and coffee-making facilities. Family rooms are available, sleeping up to 5 guests. Guests must at least 16 years of age in order to use the swimming pool. Please note the swimming pool and Gym facilities are off-site 2 minutes walk from the hotel. This ticket allows you to sleep in campervan or caravan during the Wychwood Festival 2019 from Friday, 31st May - Sunday, 2nd June 2019.